pecial rates at hotels in Rio with payment at check in! 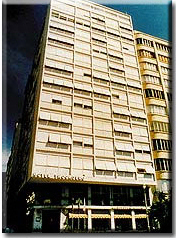 Located Right In Front Of Copacabana Beach, The Trocadero Othon Travel Is A Modern And Comfortable Hotel Offering Affordable Rates And Tour Attractions Throughout The City Of Rio De Janeiro. The Capital Of Rio Welcomes Its Visitors With Open Arms, As The Christ The Redeemer, Observing The City From Above. For Its Hospitality, Joy, And Beautiful Tourist Spots, It Is Not A Surprise That Rio Is One Of The Cities That Most Receives Visitors In Brazil. Places Like The Sugar Loaf And Corcovado, Are Only Some Of The Vast Opportunity Of Sightings The City Offers. But Rio Has Much More To Offer. From Ecological Walks Through The Tijuca Forest, Or The Botanical Garden, To The Cultural Places Like The National Historical Museum, Not To Forget The Beaches, The Marvelous City Offers Different Activities To Each Visitor. After Touring Various Attractions, You Are Invited Back To The Comfort And Convenience Of Your Selected Accommodations. All Guest Rooms Are Tastefully Appointed And Equipped With Modern Amenities. Each Guest Will Feel Safe And Secure With Electronic Room Keys And Restricted Access To Guest Floors. The Staff Takes Extreme Measures To Make Sure That Each And Every Guest Feels Welcome And Unique. Each Member Of The Hospitality Staff Provides First Class Customer Service In A Professional And Personalized Fashion. The Trocadero Othon Travel Provides The Perfect Scene For A Weekend Getaway Or An Extended Vacation. Rio De Janeiro Is A City That Mixes Rhythms And Landscapes In A Way That Pleases Everyone, Tourists And Residents Alike.